These are the final images, we carry with us, of our last morning heading out of Portland. It was our 26th wedding anniversary b'fast date, July 12. Yes, 26. It's mind boggling. 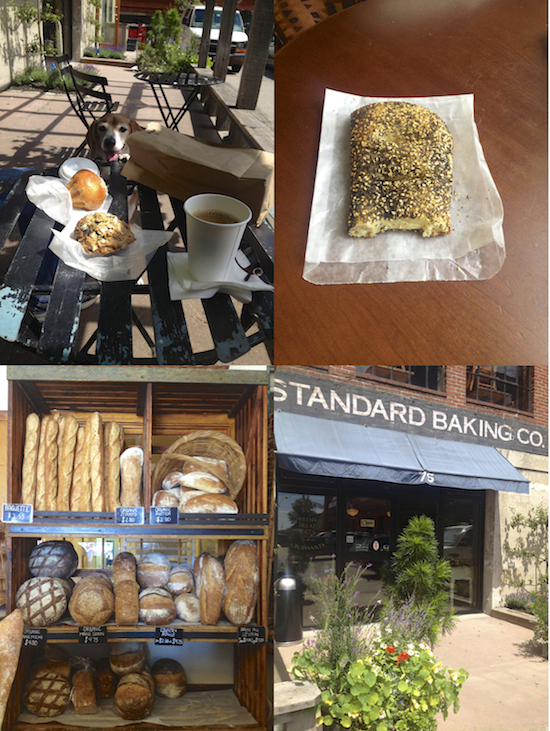 Standard Baking Co. would be my daily routine if I lived in Portland. I would be light reading, avoiding any dreary daily news, outside, under the grapevines pergola, with coffee and my daily whim, pastry. It is exactly the pastry and bakery shop I wish I had in my own neighborhood. I've seen a review that read 'quite possibly Standard Baking Co. might be the best bakery/pastry shop on the East Coast'. I concur. We got an assortment of pastries. A brioche, of course, and although I am not a scone lover, I couldn't resist this very alluring wild Maine blueberry oat scone innocently sitting there on a multi tiered stand. The wild Maine blueberries flavor and color vibrantly popped through the nutty oat, and it converted me into the scone lover column. The multi seed fougasse reminded us of our all time favorite zaatar Jerusalem bagel. There was another fougasse in the bunch, that I am certain was just as good but paled in comparison to the multi seed that invoked such reminiscent sentiments in us all. The croissant we brought back to the hotel for S was flaky and buttery and the pizza, cold, to take on the road, was probably not such a brilliant idea on my part. As we were heading up on Rt. 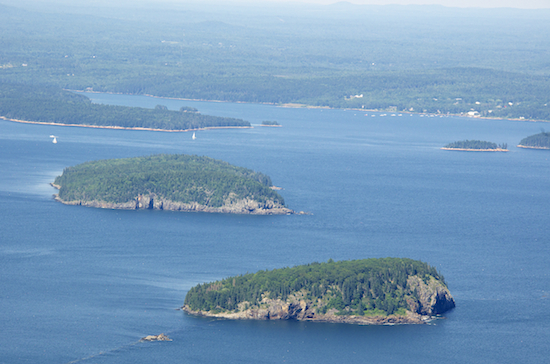 1 towards Acadia National Park, I was thinking when in Maine, do as Mainers do and have freshly caught Maine lobster. Problem is crustaceans never attracted me, even perfectly cooked, they are way too rubbery. These 'bottom dwellers', the lowest class of aquatic life, have a nasty reputation which added further to my lackluster interest for anything shellfish. In addition S is extremely allergic to shellfish among other foods and there is the kosher issue too. With that being said, I couldn't fight my fascination with the cult like crab boils and lobster fests. Like looking from the outside in, into an exclusive illuminated club, and I wanted in. Bib, lobster cracker, metal seafood pick and all. In the past, out of curiosity, I had shrimp on a couple of occasions, so what's to come isn't a first. I had done my homework. More often than not I can tell from research whether I will like a place or not. I have seen many lobster rolls in the course of the days prior to our road trip up north that were laden with buckets of mayonnaise, so when a social media friend urged me to go to Red's Eat, I took one look and knew it was the mother lode (I love that expression). Jonathan and S harping on my innermost superstitions, egging me on, "Go on, go on," as we stop short of a small bridge at the edge of the waters. With pause, Jonathan nonchalantly adds "you might be smite by g-d," with S echoing in right behind him with the same sentiment. Such a father/son duo with similar sensibilities and wicked (insert a New England accent here) dry sense of humor. 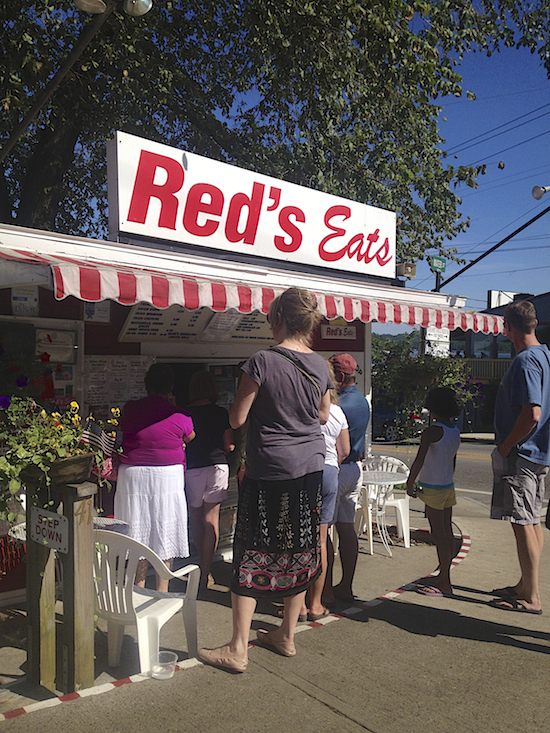 I shudder thinking I might be struck by lightening on this pristine, sunny mid-day in Maine as I approach Red's Eats lobster shack, tucked at the corner of the water's edge. The fried clams looked amazing but I ordered the lobster roll with market prices fluctuating daily depending on that morning's fishermen's catch. The all cash shack has an ATM conveniently erected nearby for tourists such as us traveling with little currency. The lobster is served in the purest form. No salt, no mayo and no butter on the roll. You can customize your add ons served on the side. The color of the melted warm butter was a stunning crystal clear yellow, clarified butter like. I ordered the freshly caught haddock sandwich for Jonathan and when I mentioned S' allergies, they strongly discouraged me from ordering anything on the menu for him at the shack. S remained starved. If I loved lobster I think this would be the epitome of lobsters worldwide. Its uncompromising purity and whopper of a daily catch price, just under $18 a roll, was wasted on me. Intellectually and in my gut I understood why Red's Eat is such a sought after destination with long lines, but lobster doesn't run in my veins. It's not going to be an acquired taste either, like raw fish sushi was to me, as I got the desire to experience it out of my system. I still do not like crustaceans and I was not struck (yet) by g-d but if I liked them crustaceans, Red Eats would be my ultimate destination. My heart sank at the sight of kitschy establishments along the road as we approached Bar Harbor, though in contrast the skies were painted with iridescent magenta sunset colors. The next morning we woke up to discover a cute little town. The bagels at Morning Glory Bakery were all right and I should have ordered my cappuccino a double shot. There was a complete lack of awareness or care for allergies even though I mentioned them. One of the gals there accidentally included, I believe it was, walnut cream cheese in our order. It was messy. 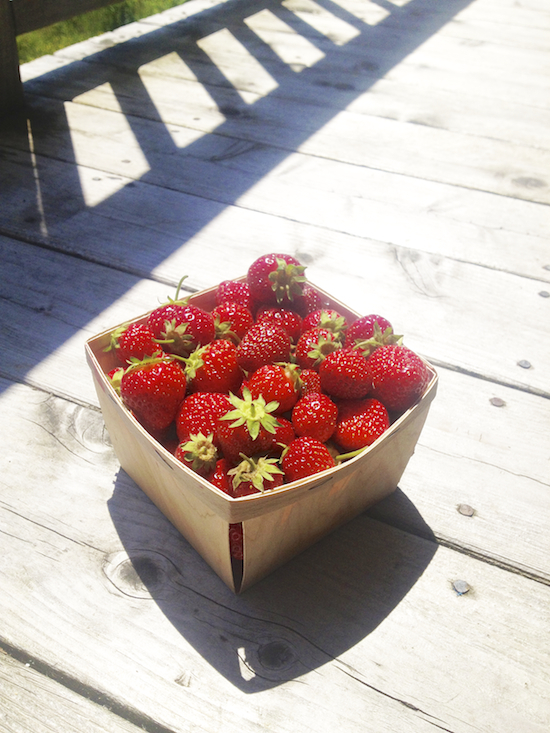 As we were heading back to our hotel room, I realized I hadn't eaten fruit, which I usually gorge on 24/7, during our entire time in Maine, so we stopped by the grocers got some bananas and scored some local Maine strawberries. I don't think we had in years strawberries bursting with this much flavor. We were snacking on them on the porch, watching people crossing the exposed sand bar on low tide into Bar Island. During high tide the waters are too high above Jonathan's 6' head, much less my meager 5'1'. I got talking to one of the patrons at the grocer's and she mentioned the farmers market on Sundays by the Y which by the way offers a daily gym membership pass if you must stick to your workout regimen. 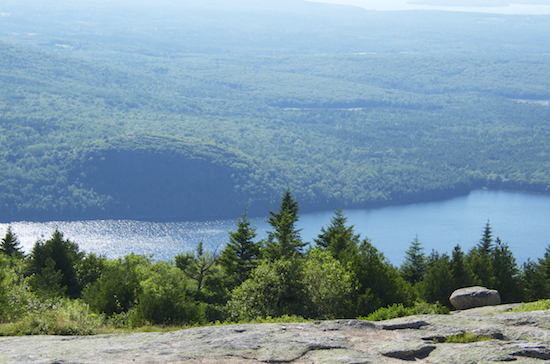 Our outdoors expeditions were somewhat stunted with Wizard, our dog, not being well but I really wished the guys to conquer the outdoors in Acadia National Park. I dropped them off at the base of Cadillac Mountain, armored with light snacks and enough water to hydrate in their backpacks, and then drove up to the peak with Wizard to take in the vistas. It was more intense than they expected. They really thought it would be a breeze at first, but they felt satisfied and accomplished with their foreheads still glistening with drops of sweat and their backs drenched wet. We were famished and I had planned to go dine at The Jordan Pond House (not to mix it up with Jordan's in town) where they are pet friendly with benches on sprawling grass greens and cap it off with ice cream at a much hyped ice cream parlor, Mount Desert Island Ice Cream, where President Obama and the first family visited. My guys begged me to abandon my iPhone list and be spontaneous. They wished to just flow and follow their instincts. Dinner at the park on the village green was takeout from a nice looking Italian restaurant just down the road. Although S claims his dish was great, trust me the food was awful, but it was a lovely evening and we enjoyed 'picnicking' outdoors. Jonathan and S zipped across the street and got some ice cream from CJ's Big Dipper. S, a vanilla/blueberry soft serve swirl and Jonathan, pure blueberry soft serve ice cream. After I tasted J's, I had to have my own swirl cup too. I have no idea if the blueberries were real wild Maine blueberries or real at all for that matter, but I'd like to think so. 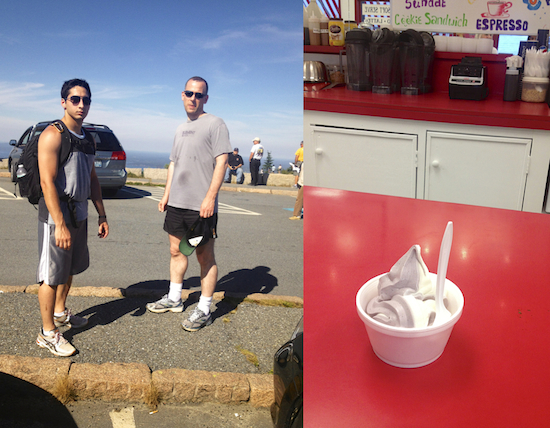 Spontaneity has its pitfalls but the rewards can be as awesome as ice cream. 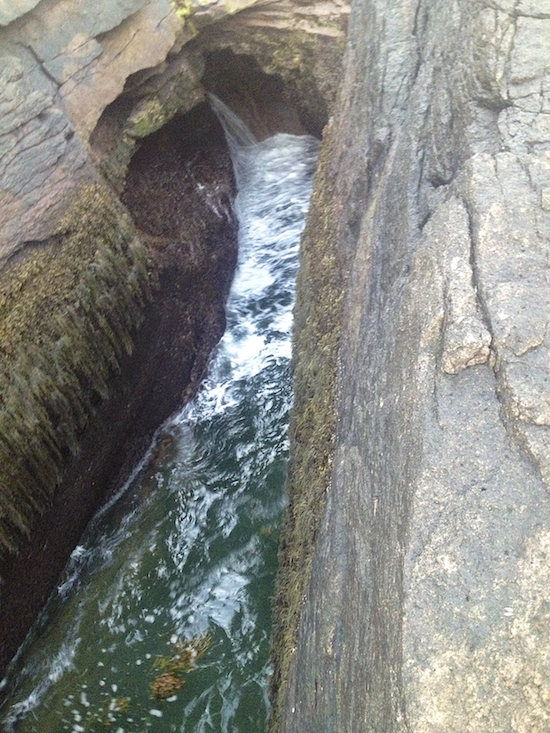 Acadia National Park isn't known for its waterfalls, but its lushness is breathtaking just the same. 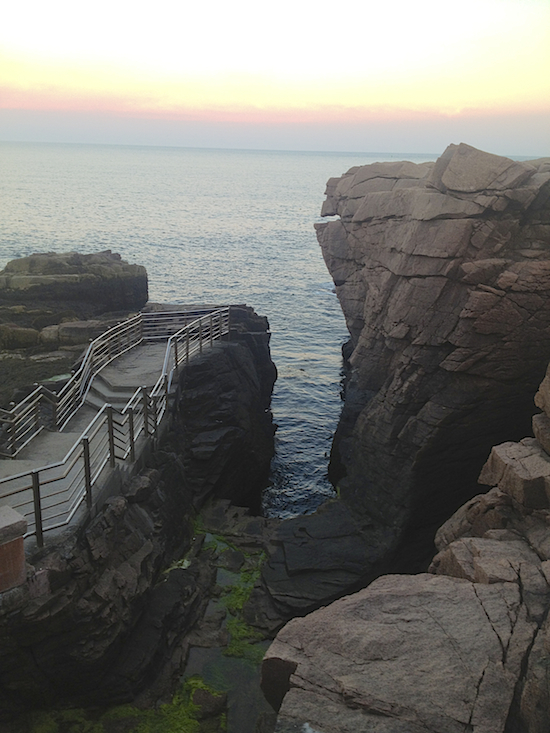 After our early dinner, we were chasing the light, hoping to watch the sunset at Thunder Hole. One thing led to another and we had to take the entire park loop. Even at low tide, as you can see above, it is quite a sight and we caught a spectacular sunset. 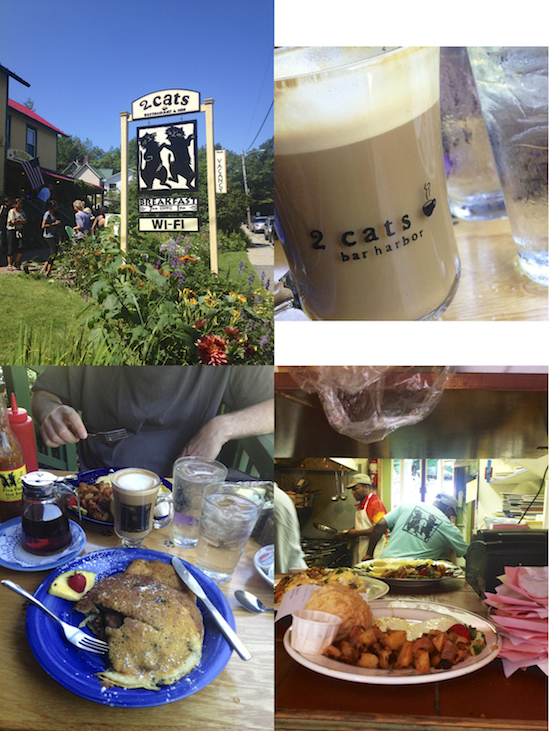 To round our trip up, we had a b'fast date at 2 Cats before our checkout. They are only open till 1pm for b'fast and brunch. This charming little Inn's restaurant was super busy with a long wait line. Good of me to make reservations ahead of time. We were immediately seated at the table on the porch. The waiter and service were super attentive even if the place was hopping. Turns out he is originally from Virginia and much of the workforce in town goes on a pilgrimage up north to Maine during the busy summer travel months. The Inn's windows were dressed with delicate lace shades. 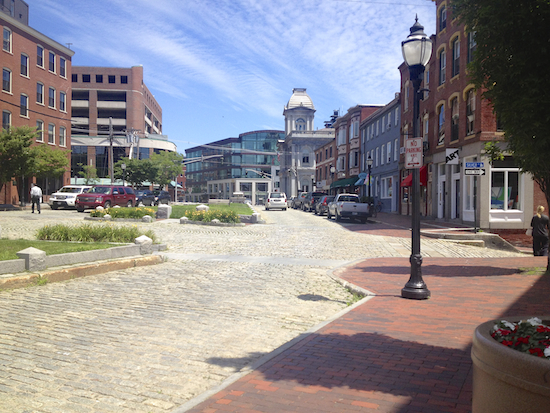 The weather was perfect, sunny with a light breeze. I ordered the Maine wild blueberries pancakes with strawberry butter and Jonathan ordered the tomatoes, kalamata olives and feta omelet with homemade biscuits and spicy home fries. Everything on the menu was delicious but particularly Jonathan's dish, every single item on the plate was perfectly made and well seasoned all around. Let's backtrack a bit before we dived into our b'fast. I had to have coffee, the little I've knew how much I would love it. The waiter recommended the real maple syrup latte. I had two each with double shot of organic coffee beans espresso. It was delicately laced with maple syrup. The best coffee I had in Maine. After consulting with the waiter, we settled on taking out a no tomatoes, but otherwise identical to Jonathan's, omelet plate with biscuit and spicy fries for S. Both the waiter and we figured it would be easier to clean the omelet pan and spatula prior to making S' omelet, but cleaning the pancake griddle would be impossible. TY, Rosa. Really? I am curious why only twice? 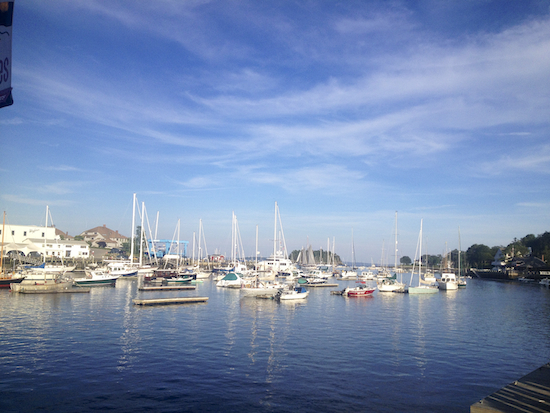 I love Mount Desert Island ice cream! The location in Portland often has vegan ice cream but I still remember the cardamom ice cream at the MDI location in Bar Harbor a few years back before I had gone vegan. Best ice cream I ever had! Beautiful photos, I love this series on your travels. 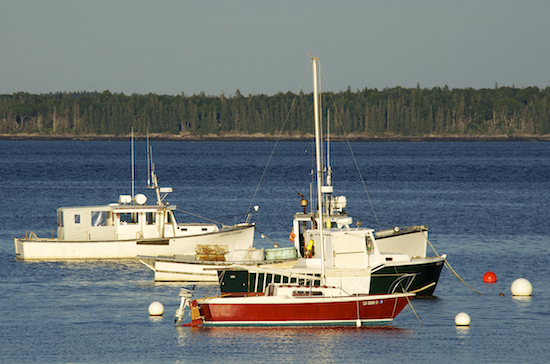 Adding Maine to my bucket list! TY Laura. I already wish to revisit. Beautiful pictures and Happy 26 years, awesome. And here's to another 26! I do love shellfish though no oysters for me. We really never ate it growing up(except for the clam rolls at the local Howard Johnson's) but my mother always thought lobster was so sophisticated. The first time she met my father's parents she ordered lobster and word has it that they wondered what kind of a girl is this? A shiksa? And no she wasn't...I'm sure her mother would have rolled over in her grave had she known! Shulie, it's what happens when you grow up Jewish in a small town! Fabulous!!! 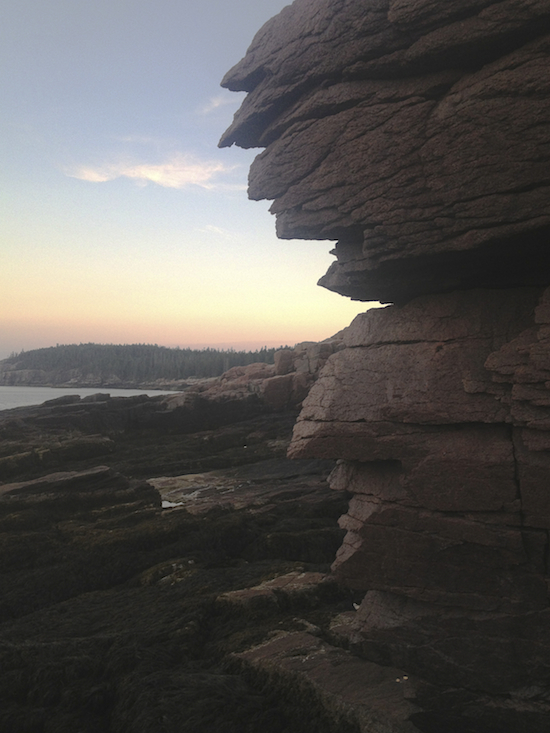 I've never visited the East and I've SO placed Maine high on my travel list solely from reading your posts. BEautiful shot!!! I love that your son is traveling with you, it gives me hope that when my boy heads to college next year he may still join us for a family trip! !